Pink & Pretty: a new year. I've never been one to really care for new years. Up until this past year, each year seemed to roll pleasantly into the next and I never really thought much of it. That is, until 2013 happened. Let's just say 2013 was a difficult year. It had it's challenge, after challenge and I spent the majority of the year trying desperately to get a proper hold on life. I've learned so much about myself, life, relationships and marriage over the past year and I've grown up beyond my years in a matter of months. I really can't begin to explain how happy I am that this year is done. In saying that, though, I can't help but be thankful for the very distinct lessons I've learned in 2013. Up until about a month ago, I was having a hard time understanding why my marriage ended but I've discovered that there were important lessons to be learned. Sure, I could have learned them without the heartache of a failed marriage but I'm not sure I would've really learned the value of those lessons if I had not gone through those difficult times. With each passing day, I've become more aware of the true happiness life can bring when your mind, body and soul are in a good place. Not to mention, surrounding yourself with positive people helps too. So I'm going to take those lessons I've learned in 2013 and skip into 2014 with my head held high knowing I am in a much, MUCH better and happier place than I was one year ago today. I can't help but be thankful for that! I am so VERY excited for 2014 - I have no doubt that this year will be one of the best years yet and I can't wait to see what it has in store for me! I am so ready to get it RIGHT this time. Great post Megan. It's always so hard when we are amidst the pain and anguish but there is always a lesson to be learned. I've learned that everything always happens for a reason and we may not know it at the time but someday we will. I hope that 2014 brings you the happiness you deserve and is the new start you were looking for. Cheers to you, Megan!! I'm sorry last year was so rough, but you are so right. 2014 will be better and brighter!! Happy New Year! 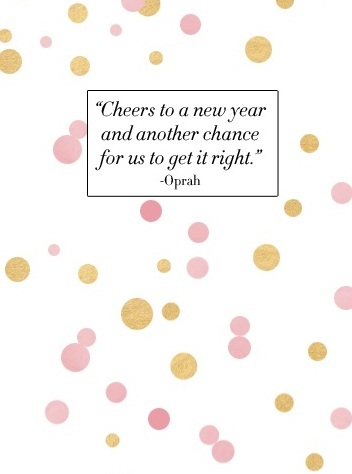 Hope you have an amazing 2014!